I am working to complete the library in the Cross House, and have been holding back images to do a dramatic Before/After reveal. I am dedicated to meticulously restoring the house, and look forward to its being returned as close as possible to what it would have looked like when built. However, I have no desire to recreate a Victorian-era decor. I yearn for the house, when complete, to have a youthful, lively quality, and believe this can be achieved with the right colors, fabrics, and furnishings. Trying to decoratively bring an 1894 house into 2015 will be no easy task. While the colors, fabrics, and furnishings will have a contemporary feel, I still very much want them to complement the 1894 structure, and not fight with it. So, no mirrored disco ball in the living room, for example. For many months now I have been scouring the Internet for curtains for the library. I settled on a black/white damask pattern. Such a pattern may well have been used in the house in 1894. Although not in black/white! I though the colors would offer the contemporary edge I was seeking. At last, I found a fabric which was well poised on the fine line between between complementing the 1894 house, while still seeming fresh. I ordered a yard to make sure. The yard arrived and I rushed to tack it up in the library! I then stood back, breathless with anticipation! And was unimpressed. The pattern was just not large enough for the scale of the room. The scale was kinda…insipid. And whatever one might call the Cross House, insipid it ain’t. So, back to square one, and hours and hours more on the Internet. Out of desperation I clicked on: Wal-Mart. And within moments my eyes widened at a potential candidate. Could it be? Was it possible? And at…Wal-Mart???????? 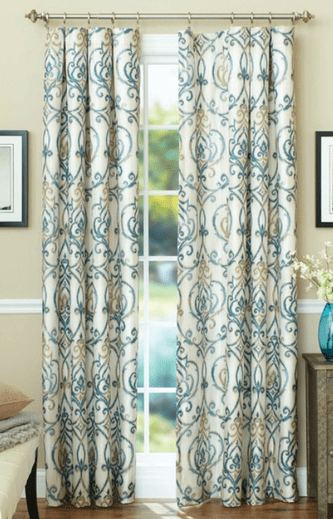 Better Homes and Gardens Ikat Scroll Curtain Panel. Over the following day, I continued the hunt but kept coming back to the above. And fell in love. The pattern complements the 1894 house. The scale of the pattern should fit the room and look the opposite of insipid. The colors are perfect with the wall color, and also perfectly complement the stained-glass windows which will be visible above the curtains. Most importantly, the curtains look fresh and contemporary. So, even though I am working away at paying off the titanic-sized invoice to have all the radiators repaired and put into proper order, I figured I could order one panel (at $15.27). After the one panel arrived, I could confirm the brilliance of my choice, and then after paying off the radiator balance, I could order seven more panels. 14 Responses to Thwarted by…Curtains! Oddly, I’ve had good luck with jc penney, one of the few places with long lengths and lots of sales, although those walmart ones would look good with the blue walls. What are you doing for curtain rods? About 5 years ago I purchased fabulous curtains at, yes, JC Penny (by Cindy Crawford, no less!). They are also perfect for the Cross House, but the line has been discontinued. Nothing JC has currently is right for the Cross House. “…no mirrored disco ball in the living room..” But I just bought my platform shoes!!!! They are gorgeous! A much better solution than the black and white giant damask. Be persistent, maybe these are backordered and will be back in stock. If not, finding these will lead you to the next thing which will be even better. P.S. I have also been surprised at what I could find at Wal-mart. Have you tried JCPenney online? Yes, I tried JC Penny. See my comment above. NOTE: An update is in my next post! Ross, you might also try my mother’s fabric store in Chanute KS. She may have something that will work for you or be able to make exactly what you are looking for. Somewhere in an old house blog I heard an expert interior designer say (maybe Elsie DeWolfe) that if the windows are good looking, you don’t need curtains and with that knockout trim you have, you don’t need curtains. Oh, I very much do need curtains! First, curtains improve the acoustics of a room. Second, my house is VERY public. People are always walking onto the porches and peering into the windows. Even with the blinds, people can still peer in through the edges of the blinds. And they do. Well, there is NO WAY I want to be on public display 24/7! At night, I want to close the curtains and KNOW that I have some privacy!